Brentor Church | Launceston Then! Cornish & Devon Post, 10th May, 1947. ANOTHER STORY – BRENTOR LEGEND DISCREDITED. Services Resume in Ancient Tor Church. No landmark in the West of England is more striking than the famous Church of St Michael’s, Brentor. 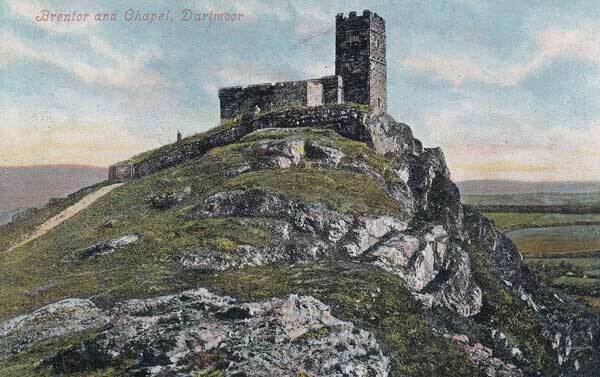 Believed to be an extinct volcano, and rising abruptly from an elevated down, the tor is visible from a great distance, and perched on the very summit of the little weather-beaten church. Only 37 feet by 14 ½ feet, it must be one of the smallest churches in Devon. The story used to be told that it was built by a merchant who, finding himself in peril of shipwreck, vowed that if saved he would build a church on the first point of land he saw. But a document recently discovered in the Duke of Bedford’s archives proves that it was built about 1130 by Robert Giffard, Lord of Weare Giffard. In the Twelfth century Brentor belonged to the Manor of Lamerton, and Robert Giffard having built the church, handed it over to Tavistock Abbey with some acres of land around the tor. Another document of the Duke of Bedford’s records the settlement of a dispute between Jordon, Abbot of Tavistock (1222-33), and Walter Giffard II, great grandson of the founder. It was agreed between the parties that the Church of St Michael’s Rock, Brenatorre, should in future be served by two priests and a clerk, who were to receive suitable yearly stipends from the Abbot and Convent, and, though subject to the Archdeacon’s jurisdiction, were not to be removed from office without reasonable cause. They were to reside at or near the church to administer the sacraments to the parishioners and to celebrate divine service daily for the souls of Walter Giffard’s ancestors and relatives, living and deceased. This agreement was confirmed by the Bishop of Exeter, and attested by the Priors of Plympton and Launceston, the Archdeacons of Exeter, Totnes and Barnstaple, Robert (Vicar of Lamerton), Robert Giffard and other witnesses. In 1283, the same Abbot John procured from Henry III, the grant of a three-day fair to be held at the Church of Brenatorre on the Eve of the Feast and the Morrow of Michaelmas. In those days fairs were not entertainments but occasions for buying and selling, all the more necessary and important because there was no regularly organised retail trade. One would suppose, however, that Brentor would not be a very convenient site for commerce; indeed, in 1535 the tolls from the fair were valued at only 6s.8d. per annum. At some date between 1535 and 1552 the fair appears to have been removed from Brentor to Tavistock, where it became, as it were, the ancestor of the present “Goosey Fair”. 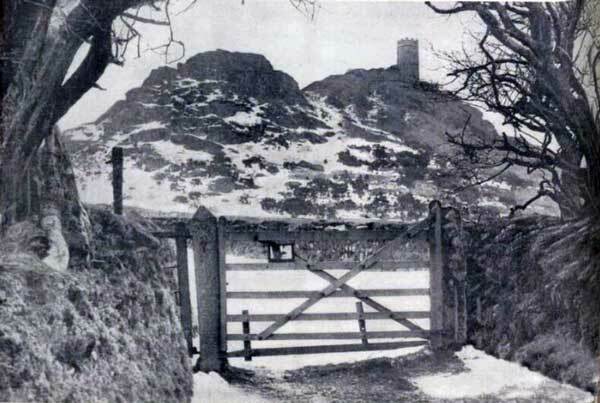 The stone still lies by the road-side at Brentor on which the pole with a glove, the usual concomitant of a fair, was erected. 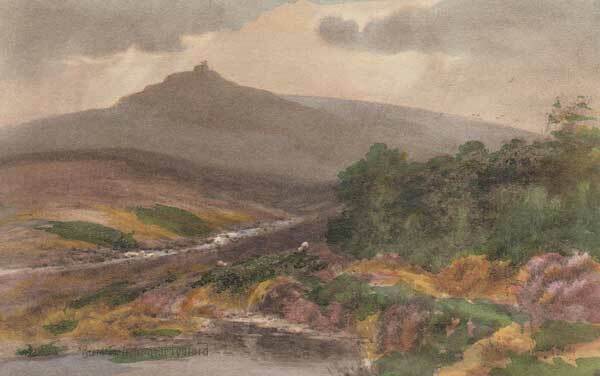 Instead of buns, which are usually eaten at country revels in the West of England, the inhabitants of Brentor could produce nothing but “cramps” – an inferior species of cake – probably due to the badness of their corn from the poverty of the soil. Thus they were called “Cramp-Eaters”. One or two interesting topographical particulars may be gleaned from surviving thirteenth-century charters. The rivulet near Holyeat was in those days called Fennilake. A well on the South side of the Church is referred to as St Michael’s Well, and there is mention of “The old walls under the rock at Brent Tor called Bynne”, a mysterious word which cannot be explained. (O.E. binn – a manger). The foregoing gives a brief idea of the history of this ancient tor and Church, where on Sunday evening the first summer service was held. Long before the time of the service, parishioners and others made their way up the rugged hillside and the bells in the Church tower were pealing out, with the flag of St George fluttering above. As one entered the beautiful Church, a visitor’s book, with already many hundreds of names in it from far and wide, seems to say “Sign in God’s presence”. The service, which was a simple evening service, was conducted by the Vicar (Rev HE Owen Davies) and the organist at Christ Church (Mr H B Randle) played the harmonium, the singing being led by the choir.